BOREN, DANIEL DAVID (1973– ). Born on August 2, 1973, in Shawnee, Oklahoma, Daniel David "Dan" Boren is the son of former Oklahoma Gov. and U.S. Sen. David L. Boren and Janna Lou Little Boren. 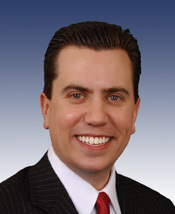 Following in his father's and grandfather's political footsteps, Democrat, Dan Boren represented District 28 in the Oklahoma House of Representatives from November 2002 to November 2004. In the general election held on November 2, 2004, Oklahomans elected him to represent Oklahoma's Second Congressional District, which encompasses most of the eastern portion of the state. Boren succeeded Brad Carson, who decided to run for the U.S. Senate. Boren served four terms as U.S. representative from 2005 to 2013. In June 2012 he announced that he would not run for reelection because he had been hired as president of corporate development for the Chickasaw Nation. Dan Boren received a bachelor's degree in economics from Texas Christian University in Fort Worth in 1997. In 2001 he obtained a master's degree in international business from the University of Oklahoma. Boren married Andrea Heupel, the sister of Josh Heupel, a former quarterback at the University of Oklahoma. The Borens have two children. Before entering politics, Boren was president of the Seminole State College Educational Foundation. He also worked as a senior aide at the Oklahoma Corporation Commission and as a staff member for former U.S. Rep. Wes Watkins. In November 2009 U.S. Rep. Boren and thirty-nine other Democrats voted against the Patient Protection and Affordable Care Act. Boren stated that only 17 percent of his constituents supported the bill. He also voted against the final bill in March 2010. In January 2011 Boren and two other Democrats voted with the Republican caucus for repeal of the act. During his tenure in the U.S. House, he continued to be one of a few Democrats who opposed legislation to withdraw troops from Iraq by April 1, 2008, and who supported the Energy Tax Prevention Act in March 2011. Boren, a fiscal conservative, and four other Democrats voted for the Cut, Cap, and Balance Act in July 2011. U.S. Rep. Boren served on the subcommittees on Readiness and on Air and Land Forces under the jurisdiction of the Armed Services Committee. He had also served on two subcommittees of the Natural Resources Committee and of the Permanent Select Committee on Intelligence. Biographical Directory of the American Congress, 1774–Present (Washington, D.C.: U.S. Congress, http://bioguide.congress.gov (accessed November 6, 2013). "Dan Boren," Vertical File, Research Division, Oklahoma Historical Society, Oklahoma City. "Daniel David Boren," Vertical File, Jan Eric Cartwright Memorial Library, State Capitol Building, Oklahoma City. Daily Oklahoman (Oklahoma City), 18 July 2002 and 20 June 2012. The Oklahoman (Oklahoma City), 20 January 2011. Tulsa (Oklahoma) World, 3 November 2004. Linda D. Wilson, "Boren, Daniel David," The Encyclopedia of Oklahoma History and Culture, https://www.okhistory.org/publications/enc/entry.php?entry=BO034.